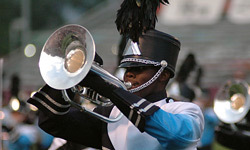 Tickets for the Central Illinois and Kalamazoo Drum Corps International premier events are now on sale. Orders for these two events can be placed online through DCI.org or by calling 630.628.7888 x3. DCI Central Illinois On Friday, June 27, eight of the top World Class drum and bugle corps will return to Illinois State University in Normal, Ill. Tickets are available for $20 or $15 for groups of 25 or more. View more info and order tickets. DCI Kalamazoo On Saturday, July 5, 15 drum corps will make their way into Western Michigan University in Kalamazoo. Ticket prices range from $25 to $65, or $18 for groups of 25 or more. Drum corps fans looking for the ultimate experience in Kalamazoo will not want to miss out on the $65 Super Premium tickets which in addition to being some of the best seats in the house, include dinner and a VIP parking pass. View more info and order tickets.